Getting your boss to buy into a data visualization investment plan they see only as expensive can be a showstopper. This post provides some insights into how to frame the conversation to your boss for them to look past the upfront costs and see the business benefits of data visualization investment. Getting the budget needed to ramp up data visualization operations is a challenge I see many companies, even the most progressive and deep-pocketed, face. 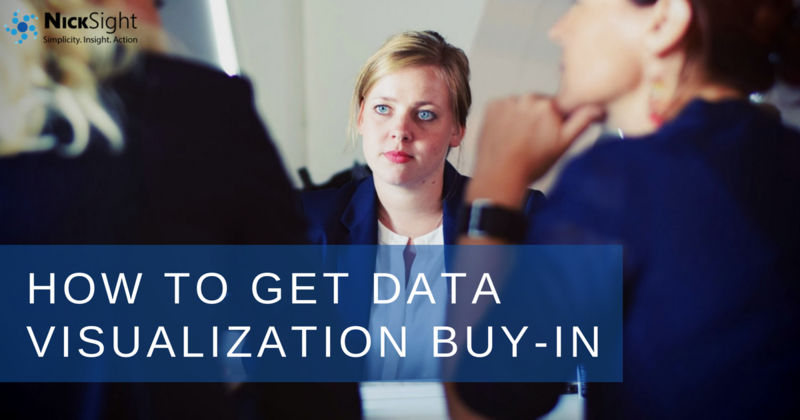 In this post, we will walk through how to apply a marketing approach to selling your boss on investing in data visualization by highlighting the function’s value proposition as it relates to the business. Let’s start by sharing a story from my experience in the field as a data dashboard consultant. During the workshop sessions, the analytics director, let’s call him Steve, came to me and wanted a few minutes of my time outside of our workshop. Steve was brought onboard three months prior and was considered “progressive” by his company’s definition. He explained to me that he wanted to sell his boss on a more effective and efficient way the analytics team can take the workshop knowledge and implement it into a software program that was currently only licensed out to a few of the team members. Added licenses were a significant financial jump and required an account upgrade, but to meet expected demand and to scale their analytics business function, the entire analytics team needed to have their own software license. During their last directors’ meeting, Steve had presented a detailed cost-benefit analysis of adding licenses and upgrading the current account for entire analytics team. He had also looked at the company’s leading competitors and analyzed their output which clearly showed the competition was beating them by both volume and quality. He ended the presentation with simple math executives like to hear: if you invest in X now, you will receive Y business impact, which will result in higher quality deals, customers who stick around longer, and better annual revenue numbers. Yet, the other directors remained on the fence about the purchase decision, causing Steve’s boss to still be unsure about the investment. Education on what data visualization is and what it can do not only in the short-term but in the big picture strategy of the business’ growth trajectory. To learn what a value proposition is, take the lead from your marketing department. Without getting too granular with marketing terminology, a value proposition essentially is a summary of why someone should buy a product or service that is different from similar products or services offered by other companies. You can think of it as the hook that makes people choose to purchase from company A over company B. Once you list out what the core differentiators of data visualization are at your company, summarize them into a few short succinct sentences to form a value proposition statement. This statement should explain the relevancy, quantified value, and unique differentiators of data visualization. If you find yourself struggling deciding what makes a data visualization program different from other potential company investments competing for budget dollars, think of how marketing teams list out a product’s value propositions in preparation to market a product to consumers. Bluetooth enabled — connect your shoes with the fitness app of your choice for a more accurate tracking of your activity. This feature adds no weight to the shoe. When you look at this list, make sure none of the differentiators are offered by your competitors. If they are, they are not considered a differentiator and should be removed from the list. Start your pitch with clear benefits and the importance of data visualization to the business. Every data dashboard workshop I run begins with a short set of slides that clearly lay out the benefits of why data visualization is important and how it translates data to business value. It’s wise to keep these benefits simple and clear. Don’t over complicate and always have supporting evidence to your projections. It will allow us to improve sales, margins, etc. Our competitors are doing it, we’ll get left behind. We lost 7% market share last year and we need to get ahead. It will reduce our costs by X% year over year. We will free up Y number of staff to do higher value, higher impact projects. We can reduce our licenses in legacy technology and replace with a lower cost dashboard solution. Ideally, there will be examples you can point to in your company. If not, running a low-risk, low-cost pilot, can be used to demonstrate the value. The exercise here is about negotiation and making your case — don’t back down, and always bring data and evidence to the table while being respectful. Use terms and benefits that are applicable to your boss and what matters most to him/her. How can data visualization help my boss look good? How can data visualization help my boss get a promotion? What will make my boss look like an innovative leader in front of the other executives? Positioning the investment to your boss’ benefit will ultimately benefit you the most. Often times, however, a boss only hears what will help them and make the business more money. Pitching your value statement using these parameters will go much further than saying you or the analytics team needs some tool the executive is likely never going to see or use. Eliminate any uncertainty. When getting buy-in, always think two or three steps ahead so you will be prepared for any follow-up questions. Go through the exercise of what you expect your boss to ask immediately following your pitch to them based on your experience with them in the past. What do they usually hone in on? Have these potential objections solve for and in your back pocket. Not only will you be more prepared, but your boss will see you’re looking at the big picture and not just your own needs. 0 responses on "How to Get Data Visualization Buy-In From Your Boss"